Outgoing Alaska Governor Sarah Palin (2nd L), her husband Todd (C) look on as incoming Governor Sean Parnell (2nd R) is sworn in by Supreme Court Justice Daniel Winfree (L) during the annual Governor's Picnic July 26, 2009 at Pioneer Park in Fairbanks, Alaska. Parnell' wife Sandy held the bible for the ceremony. Craig E. Campbell was sworn in as the new Lieutenant Governor. 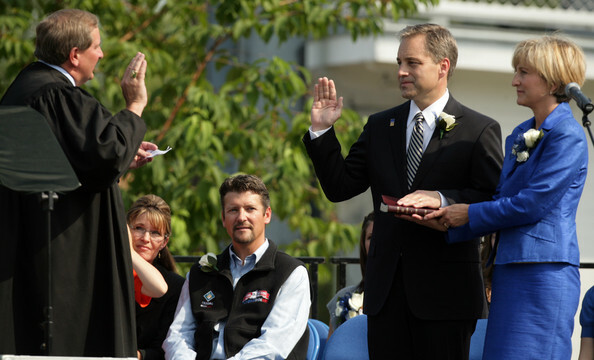 Last July in Fairbanks, with Todd smiling at her side and Piper sitting in her lap, Sarah Palin watched Lieutenant Governor Sean Parnell take the oath to fill out her term in office as Governor of Alaska. Then she vanished. For the past four months the Forty-Ninth State has seen neither hide nor hair of the woman. No speeches at chambers of commerce luncheons. No sightings on the street. No Sarah cheering on the sideline at Wasilla Warriors girls basketball games. No Sarah sitting in the pew on Sunday worshiping at the ChangePoint and Anchorage Baptist Temple evangelical mega churches. She’s been gone. Disappeared. It now turns out that while Alaskans were hunkering down for winter Sarah was in San Diego working for a woman named Lynn Vincent, the ghostwriter HarperCollins hired to cobble together Going Rogue: An American Life, Sarah’s first person account of her it-only-would-happen-in-America rise from small town mayor to small state governor to Republican Vice Presidential candidate to popular culture icon. Since Tuesday when Going Rogue was released nationwide copies of the book have been flying off the shelves at Barnes & Noble in Boise and Grand Rapids and not flying off the shelves in San Francisco and Seattle. Since I already have enough to read, I had intended to give Going Rogue a pass until I had time this weekend to motor over to the Anchorage Barnes & Noble and give Ms. Vincent’s word-smithing a skim. But on Monday I learned that I’m in the book. Not surprisingly, that piqued my interest. And then yesterday a friend lent me a copy. I’ve now read it. Here’s the review. Alaska Attorney General Dan Sullivan answers questions during a news conference in Anchorage, Alaska on Wednesday, Aug. 5, 2009. Sullivan is recommending sweeping reform to state ethics law and the process of dealing with complaints filed against public officials. FAIRBANKS — Alaska Attorney General Dan Sullivan today unveiled a proposal to reform the state ethics act. Former Gov. Sarah Palin said alleged abuses of the act drove her, in part, to resign her office. His plan would create penalties for abuses of the ethics act, would allow the state to foot legal bills for exonerated public officials, and would extend greater confidentiality for complaints. During a press conference, Sullivan said several months of ethics complaints against Palin, as well as potential abuses, propelled the lengthy report, which is part legal opinion and part research document. He said the opinion will seek to re-balance the need for an ethics act and opportunity for citizens to launch complaints, with the need to protect people in public service and to protect the long-term interests of Alaska. People filing a complaint are not barred from speaking publicly about their charges against executive branch officials. Secretary of State Hillary Clinton on NBC's "Meet the Press" this past Sunday. The woman who was prematurely counted in is out. And the woman who was prematurely counted out is in. In their vivid twin performances Sunday — Hillary on “Meet the Press” in Washington and Sarah at her farewell picnic in Fairbanks — two of the most celebrated and polarizing women in American political history offered a fascinating contrast. Hillary, who so often in the past came across as aggrieved, paranoid and press-loathing, was confident and comfortable in her role as top diplomat, discussing the world with mastery and shrugging off suggestions that she has been disappeared by her former rival, the president. Sarah, who was once a blazingly confident media darling, came across as aggrieved, paranoid and press-loathing in her new role as bizarre babe-at-large, a Nixon with hair extensions ranting about “American apologetics,” which sounds like a cross between apologists and Dianetics. Sarah once criticized Hillary for being a whiny presidential contender, arguing that women who want “to progress this country” should not complain about being under a “sharper microscope,” but instead should just work harder to prove themselves capable. Now Sarah is a whiny presidential contender, complaining about the sharper microscope that women wanting to progress this country are under and rejecting advice to work harder to prove herself capable. The Alaskan who shot to stardom a year ago as the tough embodiment of Diana the Huntress has now stepped down as governor and morphed into what the Republicans always caricatured Hillary as — preachy, screachy and angry. In denouncing Hollywood and Washington insiders in her farewell speech, she shows that the culture wars are still alive, at least for some. Sarah Palin and her husband, Todd, congratulate incoming Alaska Gov. Sean Parnell. Sarah Palin’s valedictory address as governor of Alaska will (we hope) be little noted nor long remembered. But its denunciation of Hollywood and Washington insiders reflects a perennial obsession by some conservatives that mainstream politicians are too eager to indulge. As Republicans regroup after the disaster of 2008, they would be wise to resist this shrill siren song. FAIRBANKS, Alaska — Sarah Palin stepped down Sunday as Alaska governor to write a book and build a right-of-center coalition, but she left her long-term political plans unclear and refused to address speculation she would seek a 2012 presidential bid. Her first order of business as a private citizen is to speak Aug. 8 at the Ronald Reagan Presidential Library in California. She also wants to campaign for political candidates from coast to coast, and continue to speak her mind on the social networking site Twitter. She didn’t elaborate, but Palin said when she announced her resignation July 3 that she was tired of the media focus on her family and felt she had been unfairly treated by reporters. Friend and foe alike have speculated that Palin may host a radio or TV show, launch a lucrative speaking career or seek higher office in Washington. Palin hasn’t ruled out any of those options, and her political action committee, SarahPAC, has raised more than $1 million, said Meghan Stapleton, a spokeswoman for the committee and the Palin family.